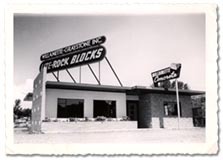 In July of 1946, Willamette Concrete Products began manufacturing concrete block in response to the post World War II building boom. 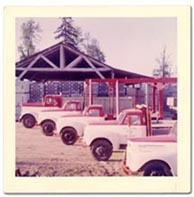 The original manufacturing plant was built on a 150' x 200' lot on the Willamette River between Eugene and Springfield. 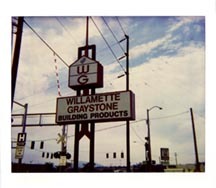 Willamette Concrete Products merged with a neighboring facility, Graystone Products, to become Willamette Graystone, Inc. The purchase of Builders Supply of Medford added manufacturing capacity, while Smithwich Block's acquisition provided a west Eugene retail outlet. Capital Block of Salem was acquired and production capacity was again increased. Chrystalite Tile of Roseburg was purchased and converted from a manufacturing facility to a retail center. Coos Bay Dredging was acquired. Bend Office & Plant was built and started operations. Builders Supply of Medford was sold, and the west Eugene retail outlet was closed. Concrete Paving Stones of Boring was purchased to better serve the Portland area. It was subsequently moved to Wood Village, where a new facility was built to manufacture interlocking concrete pavers and stepping stones. Pumilite Corvallis operation purchased and renamed Willamette Graystone. The Wood Village location began manufacturing concrete septic tanks, and added a new warehouse facility and an expanded sales office. Corvallis facility doubled in size when it moved to a new location on Highway 99. McMinnville Concrete, Fireplace and Stove was purchased and relocated to the five-acre site of a former Copeland's Lumber. 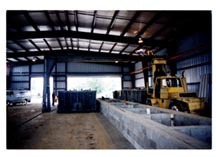 Full production is achieved by adding Concrete Pavers and more SRW as major product lines in WV Mfg. Willamette Graystone purchased Pumilite from the Hammer family. Pumilite was one of Willamette Graystone's largest dealers for many years. 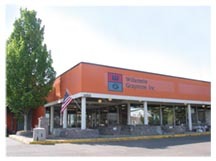 Willamette Graystone purchased Cascade Block in Medford & Grants Pass.